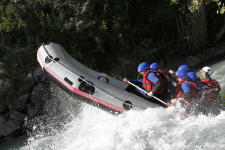 Intense emotions and sensations guaranteed aboard our rafts! We welcome you at our rafting base, the closest one from Annecy, situated on the edge of the Isère River. 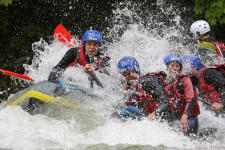 Our team of rafting instructors will know how to make this moment in running waters unforgettable ! Gorges of Centron offer a beautiful descent in the wildest part of the Isère. It is an ideal course for beginners and families (children from 8 years) who want to have a first approach of this white water activity and have fun at the same time. 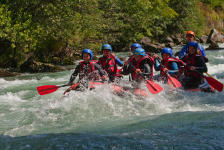 Leave for a shortened version of the full Isère rafting course : 12 km for a late morning departure, and a reasonable price ! This is a beautiful descent with varied sceneries; ideal for beginners who, even if they have never done rafting before, want to have great sensations. 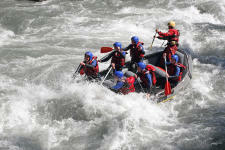 The most experimented will have fun thanks to the duration and the variety of the rapids. An intense program for a beautiful and very sporty descent, full of action, for those who need always more adrenaline and intensity ! 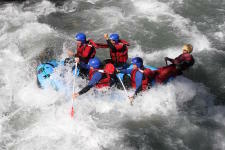 It is one of the most intense course of the French Alps, only for persons who have already practiced rafting, and enjoy strong sensations. 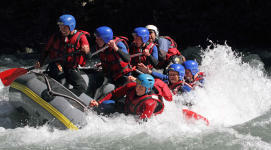 We propose you to combine the two greatest river rafting descents in the North Alps on the same afternoon. An exceptional program for an intense afternoon in the Tarentaise valley !